Acne scars may become more visible as you age, leaving you dissatisfied with your skin’s appearance and texture. At Health and Rejuvenation Center in Miami, Dr. Aleida Hera offers innovative acne scar removal options without surgery or downtime, including laser treatment with the ICON laser system. You can enjoy younger-looking, healthier skin and a significant, long-lasting reduction in acne scar visibility. To learn more about laser treatments for acne scars, book an appointment online or by phone. Acne scars are a common skin condition affecting both teens and adults. The scars are the result of acne breakouts that penetrate deep within your skin, damaging the tissue below. When acne breakouts clear up, your body naturally tries to repair the damage by producing collagen. This extra collagen, or a lack of sufficient collagen, in the healing process, can leave behind scars. As you get older, your skin loses its natural elasticity, resulting in more noticeable acne scars. If too much collagen is present, your scars may appear raised. If your body doesn’t produce enough collagen, you may have scars that form pits in your skin. Dr. Hera uses the ICON laser system that delivers beams of light to target acne scar tissue without causing damage to your skin. The laser energy triggers your body’s natural healing response and helps to break down existing scar tissue. New collagen forms to replenish your skin tissues, making your skin look healthier and younger and causing acne scars to appear significantly less noticeable. What are the benefits of laser treatments for acne scars? 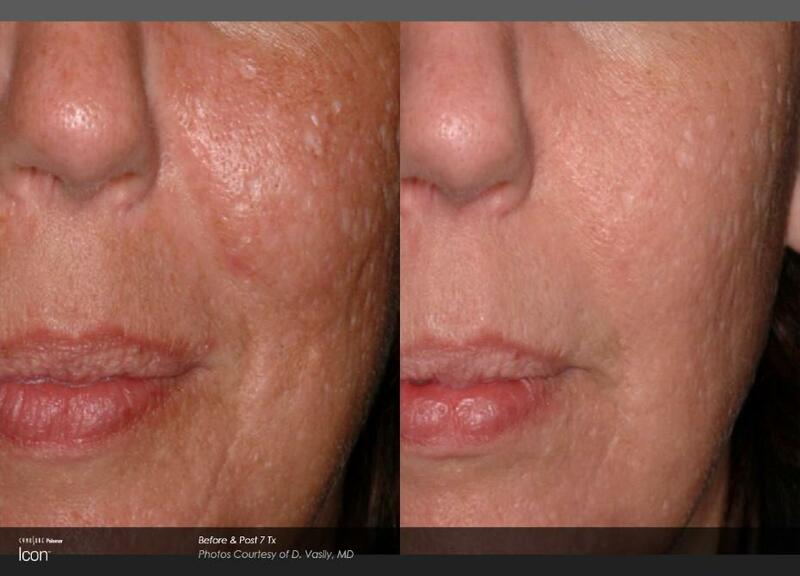 The laser system produces effective results without the need for invasive procedures or surgery. Treatment sessions typically take less than 30 minutes, depending on the size of the treatment area. Many people schedule laser treatments over their lunch breaks due to the fast, convenient treatments and minimal side effects. Dr. Hera can also use the ICON laser treatments to improve scars from previous surgeries and stretchmarks following weight loss or childbirth. Dr. Hera can determine if more than one laser treatment is necessary to improve your skin’s condition based on the severity of your scarring. While you may see significant results after your first laser treatment, you may need additional treatments to achieve your desired results and help you maintain those results. If acne scars are affecting your self-esteem, schedule a consultation with Dr. Hera online or by calling her office directly.